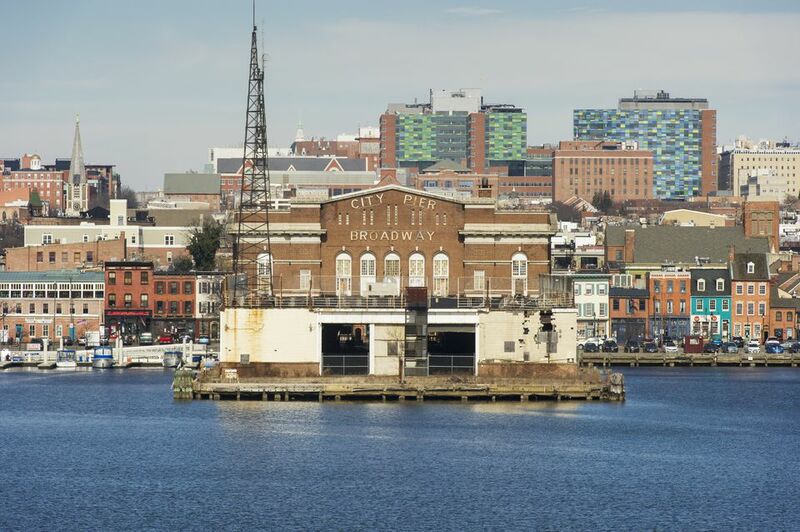 Fells Point is one of Baltimore's most storied neighborhoods. A blend of rowhomes, bars, restaurants, art galleries, antique shops and other stores, the neighborhood appeals to tourists and locals alike. Parking wasn’t on the minds of the men who built Fells Point beginning in the mid-1700s. Finding a spot on the street can be dicey, although the meters have now been changed to accept credit cards. There’s a garage on Caroline Street, but your best bet may be to take the water taxi, a plain-old land taxi, or that most old-fashioned of transportation methods, your own two feet. As you head west on Thames, be sure to duck into the Cat’s Eye Pub, one of the city’s top spots for live rhythm and blues music. To your left sits the old City Recreation Pier, which stood in for police headquarters during the filming of Homicide: Life on the Street. Across the street—in the very space where the show’s Detective John Munch (played by Richard Belzer) owned his fictional bar—now sits the Waterfront Hotel, a lively pub with solid food and live entertainment. As you continue to stroll along Thames Street, to your left sits the working pier, where the pleasure paddlewheel steamer Black-Eyed Susan and other boats dock. Continuing west on Thames, you’ll come to Sound Garden, a cool record store. Across the street sits Su Casa, a contemporary furniture store always a good bet to stock some funky merchandise. Hang a right onto Bond Street, and check out the menu at The Black Olive, one of the city’s tastiest restaurants. The fish is always fresh here, and the grilled calamari appetizer is not to be missed. A few blocks north head into One Eyed Mike’s for a shot of Grand Marnier. The neighborhood pub is home to the Grand Marnier Club, which boasts more than 1,000 members. Turn right onto Aliceanna Street, the one-time home of abolitionist, author, diplomat, and overall American hero Frederick Douglass. He lived in Fells Point before fleeing the shackles of slavery in 1838. A historical marker at the corner of Aliceanna and South Durham Street recounts his story, but before you get there be sure to take in Broadway Market, at the corner of Aliceanna and Broadway. Essentially the heart of Fells Point, the market has existed in one form or another since 1784. Fleet Street is essentially Fells Point’s Antiques Row. A plethora of stores including Another Period in Time, Antique Man, Bowery of Antiques and Collectibles, and Fred’s Refinishing Shop of Fine Antiques offer something for everyone’s style. After a long day of walking, eating and shopping, head west on Fleet Street then turn right on Broadway and walk north into Upper Fells Point, a rapidly growing section of the neighborhood chalk full of Latino restaurants.